My iMac (mid 2008) 20″ keep shutting down. Took it to Apple and and outside vendor and they say there is nothing wrong with the machine and that it could be my wall out let. They checked the power supply of the machine, but still no problem there. I have a surge protector with a modem, a printer, an Airport Expree and an alarm clock, but non goes off except the iMac. What could be the issue? I would first try plugging it in another outlet, or even plugging it in in another room, to verify that the surge protector is not overloaded. If the iMac still turns itself off, then you know that the iMac has a problem. Apple and outside service vendors don’t always get the diagnosis right. Nor, do they have the time to run extensive tests, by loading videos and other programs to verify that the temperatures don’t overheat when taxed by the intensive CPU processes running. Additionally, you could open the PSU (which I doubt the Apple store or the Apple authorized service rep inspected) to verify that none of the capacitors are bulging. This would be a good time to inspect the capacitors yourself on the MOB too. Any bulging at all, especially bulging tops on the caps is a sign of bad caps. Refer to my other online articles for reference information on MOB & PSU capacitor checks and PSU voltage measurements. Article links can be found at the Apple menu above, or the Apple link here. One other thing, I would also suggest loading the free temperature monitor and measurements program or the free iStat Pro to monitor everything that is going on with the computer, including fan speeds, temperatures, CPU and memory usage statistics, network and processes running, and other items. Jim, thanks so much for your troubles in sharing your experiences with this issue that reflects big business callouness to their unwitting customers. If only there was a way to force them to own up to their product incompetencies and make them pay. 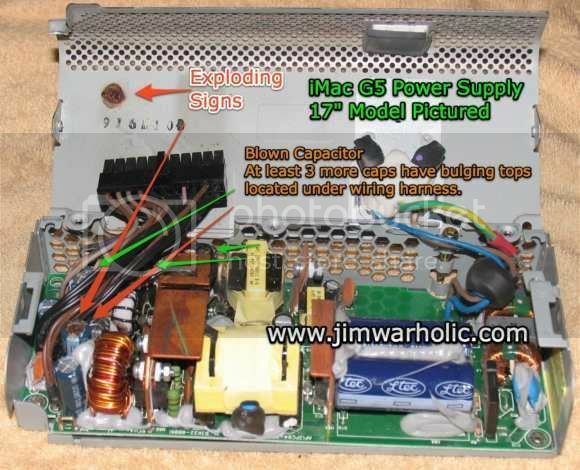 Anyway, I just finished reading most of your site and wonder if you have ever received a schematic of the power supply. I have a 20 inch G5 bought in Feb 2005 (first generation) which had the mother board replaced under Apple care within the first year or two. It is now failed again. I am going to see the Apple ‘geniuses’ tomorrow to see what they have to say. I am not bouyed with enthusiasm. I am guessing that I will either need to buy a new power supply or do the tedious work myself to replace all the caps via your helpful offerings. If I must buy a new power supply unit, I am likely to tear the old one apart in order to create a schematic of it. If you are still interested in having this information, I would be willing to comply. Best Regards, Thomas. That would be great if you could take the time to reverse engineer the schematic. However, it might be a bit of a challenge, given the fact that there are surface mount components on the bottom side that are very difficult to make out exactly what the values are, and not to mention that many of the components on the top surface are not easily indicated as to exactly their part numbers. Feel free to email me using my email address link on the right side of the site, where it says, Email: James. Hi Jim received your Caps the other day…5 days from USA to SPAIN…I couldn’ believe it !!! I,ve just had enough time to get the new Caps into my Power Supply Unit and it worked fine except for the OS being gone from the Hard Drive…as it was a second-third hand gift I didn’t get any DVD or CD and had to source myself with a new Mac OS X Tiger DVD and it now flies as if it was new…tomorrow I’ll try to source myself a new HD just in case this one dies. Anyway your site has been so helpful and I’m sure it will be in the future. De-Soldering the old Caps was a pain in the b**m but worth every penny spent. Thanks once again for your help and keep us up-to-date. I was wondering if you might be able to help me with an issue i’m having. I have the Imac 24” G5. When i push the power button the light comes and and so does the fan – there is no audible start up sound (the wind up of the fans or anything of the sort) and the screen won’t even come on. At first I thought it could be a power supply issue but the light does come one so now I’m thinking it’s the motherboard. I would try to see if it boots with the software CD/DVD. If at that point, it still does not work, then I would inspect the PSU capacitors. It is a bit difficult to verify on the 24 inch iMacs if the MOB or the PSU is the problem. You might try posting the question on the Apple forum too. More praise for your website which I have been reading cover to cover since my 20″ imac G5 stopped working about 2 weeks ago. Troubleshoot (1st led only on) pointed to logic board. Apple store genius tried to sell us a new unit, saying they no longer support our model (Gen 2, 20″ imac ALS, 2.0 processor). Inspected the logic board VERY closely and could find no caps with any hint of being bad. Took apart the power supply (version A) and immediately smelled the electric burn smell. Visual test found one 10v 2200uf cap popped and leaking. Ordered replacement cap and when it arrived, replaced the old one. Put everything back together but still no power on or any sign of life. Next plan was to do the ATX psu mod. While investigating, decided to retest the psu pinout for proper voltage, especially the 20v needed to power the display. Upon retesting, all voltages were correct. So, I thought, why not plug it in and see if it will work. Slapped the back of the machine on, and holding it together with one hand, plugged it in and turned it on with the other and got the chime and display came up. I had already taken the hard drive out to transfer photos and music to another computer, so I put it back in, screwed everything back together, PLUGGED IN THE AMBIENT LIGHT SENSOR CABLE, put the back on and pushed the power button…. NOTHING. On a hunch, took the back off, unplugged the ambient light sensor cable, put the back back on and tada: everything works perfectly. I am writing this epistle on the mac now. Apparently, there is some kind of short in the ALS keeping the computer from working. Since I don’t even know what it does and there are two others, I am planning on just keeping it unplugged. 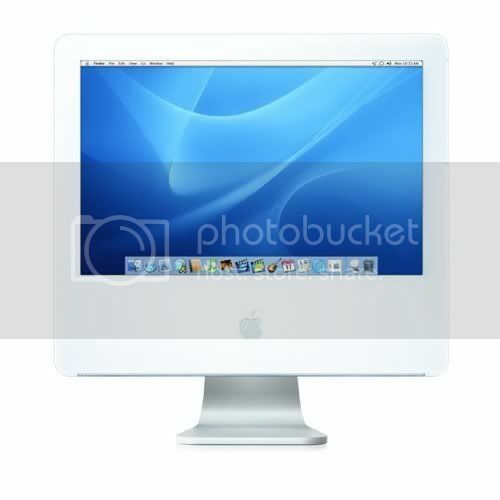 I own a G5 1.8 ghz ppc 20″ early iMac (no sensor). I’ve already had both the mob and psu replaced under the Apple extended warranty programs. A couple of years back I lost the use of the ethernet port on it but still use it for work as a graphic artist. A couple weeks back the iMac began to consistently shutdown after I put it to sleep. I’ve replaced the pram battery, zapped the pram and reset the smu to no avail. The last option is the psu. I’ve opened the back of the mac and visually examined the caps. No bulging nor leaking. I just pulled the psu and there is no smell of burnt anything. I’ll need to buy a torx screwdriver to remove the cover of the psu. Do you think that if I replace the caps on the psu my problem with the unwanted shutdown during sleep will be resolved? The iMac still boots up and does everything I need it to do otherwise except for the sleep shutdown. Any help would be greatly appreciated. It sounds like the PSU, especially if there are any bulging caps inside the PSU itself. The symptoms are indicative of a power supply problem. You were on the money. When I opened up my PSU I found a bulging cap that was leaking. Got the caps I ordered from you and finally finished replacing them today. Tested my iMac out and the sleep problem is gone. Thanks for all the clear instructions, warnings and tips as I was a neophyte at this sort of thing. As soon as I get more free time I’ll tackle replacing the caps on the MOB. I changed the caps but still no luck when I press the power button I hear a short squeak could it be the two large capacitors, or a regulator, or a transformer. It’s not likely the large capacitors. I suspect one of the other components has gone out. I would double check your voltages. Reference the PSU voltage posting for pinout information. Hey jim thanks for the reply. I changed the large capacitors (couldn’t hurt) then plugged into my computer and no luck. I then changed 4 SMD voltage regulators (not easy) and I plugged it in and still no luck. But when I measure the voltages I do believe I am getting more than the last time I checked with a multimeter. Most of the voltages are about half of what they need to be though. Any ideas? At this point, it is probably best to get a new PSU. I have a 20″ ALS with graphic issues (blocks all over the screen internal and external) so fairly certain it’s the graphics chip as had done the caps. So I just purchased another that had PSU issues. When I powered the new unit on – LED1 is on, when you power up nothing happens – so assume needs some new capacitors? I took the PSU from my old unit (I had previously replaced all caps) and plugged this in it booted fine. Did a few software updates left it over night and it woke from sleep etc fine. So upgraded the ram etc. went out and left it on doing an more updates. Came back and updates requested a reboot – let it do this and when I came back the unit was off? I could not remember shutting it down. So powered to find out but came back 1hr later and it was shutdown. Now concerned. Long story short does not power up now – LED1 is on, LED 2 flashes quickly and then nothing ? Again would a new cap set sort this – I am asking as I did these 4 months back and where previously fine so puzzled. I have looked over the MB and cannot see any bulging caps at all. Is it possible that something on the MB or unit blew my good PSU? I have also plugged in a 17″ ALS PSU (does not fit inside case but for test) and the unit powered up to the login prompt fine. Have not left it attached for fear of blowing this as well. I suspect the PSU now has a problem. It is possible that some of the caps on the MOB, even though you do not see any signs of bulging, are bad. I have seen MOB caps that do not show any signs of problems, yet after replacing the caps, then everything worked fine. What typically happens with these older MOB caps, is the electrolytic juice drys out, and simply does not allow the capacitor to function, to properly filter out the AC ripple. Then, when a new or rebuilt PSU is plugged into the computer, the PSU has to work harder in order to produce the same DC voltages. This is when the cascading failure begins to happen. Thanks – sounds highly possible. I have the caps to do the logic board – just need to repair the PSU’s – not sure which I prefer but both need to be done now. I replaced the caps on my original logic board & the PSU mentioned above but then got square blocks on the screen that went away with the mouse being move over them – any ideas? Cooked graphics? I also have a 17″ ALS that did not display internally I replaced the caps next to the CPU heatsink and it worked. I then decided to replace the others near the graphics connect and the back to the left and it stopped working internally but works fine on an external connection. I have been over every cap and even have another board that does the same. Any ideas? Not sure on the graphics one. On the 17 inch ALS one, I suspect there might have been a cascading failure affect. Sometimes when you pick and choose only certain caps to replace, the other ones that have not been replaced are next to go. It is kind of like the weakest link. This holds true from the MOB to the PSU and from the PSU to the MOB. By only replacing a few caps at a time, the others either in the PSU or in the MOB, end up in failure mode. Then, you end up wondering whether the few caps you installed are good anymore. I would also double check the PSU voltages (refer to my article on how to measure the voltages on the Apple PSUs). I would also check all the connectors. Try reseating all of them to make sure all the pins are making contact on the board. One other thought comes to mind; are you sure you have good solder joints? Refer to my article on how to do lead free soldering on these thick Apple logic cards. 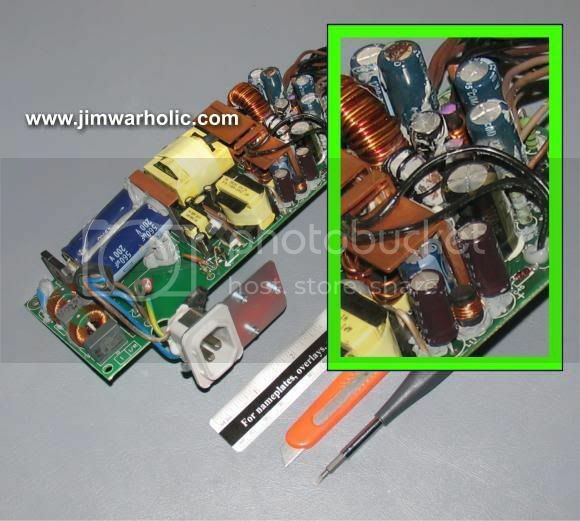 If the capacitors are only tacked in place, sometimes they are not making a solid connection through the circuit board hole wall, and thus not getting a good connection to the top surface of the circuit board. 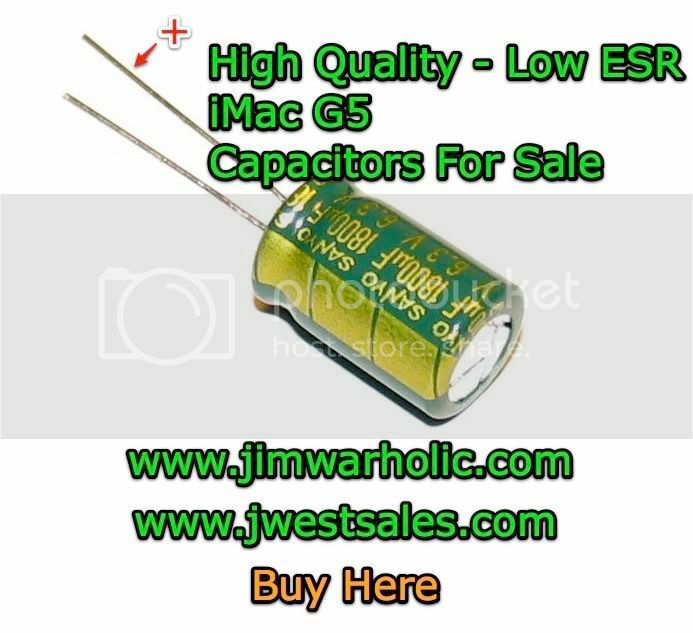 I just got done replacing the capacitors on my iSight G5 that will not start up (no fans or display). It had a couple swelled capacitors and one that was leaking. I ordered the capacitors from the link on this site and it was a breeze to install. Before the repair I noticed that when plugged in the power supply “ticked”, and made a very rapid and quiet clicking noise… What could this be? It remains even after all the capacitors were replaced. When plugged in diagnostic led #1 is on, but that’s it; when you hit the power button there is no change. Any suggestions? Power supply bad? Is there anything I can fix on it besides the capacitors? Thanks Steve, what a fantastic site with so much info! Are you sure it is coming from the PSU? I have actually heard a hard drive ticking when it was moving the read heads searching the disk, but could not read it (in this case, the disk had crashed). Did you try plugging in the PSU, just by itself, and measure the voltages from the pin connector? Refer to the article link in my Apple information page for measuring the PSU voltages. If it is the PSU ticking, I suspect that either the small transformer is shorted internally or one of the other components is charging and discharging with an internal short. At this point in time, after double checking to make sure all the solder joints are good, it sounds like you might need a new PSU. Jim, the symptoms Alex in comment 149 has are exactly the same as mine. I’ve heard the HD failure click many times and this is not the same. It is a ticking sound just like he describes and as SOON as you plug the power in, without try to start the computer. The LED 1 almost flickers to the same beat. Alex, if you are reading this, what was your solution? PSU 1 – shows trickle voltage LED1 and nothing else. PSU 2 – shows trickle voltage LED2 and then LED2 comes on but goes out and I hear a squeak from the PSU case. Do you know where I can buy those WT7515 IC chips? That’s a tough one. I suspect try doing a Google Search for the p/n. The voltage across the plates of the capacitor, in normal use, causes electrolysis in the electrolyte solution. i.e. breaking down the solution into its constituent atoms/molecules. This process ‘consumes’ the solution because the solution is converted into various gases. The rate of consumption is highly dependent on the voltage applied (higher voltage=more electrolysis!). As the capacitor ages, this process begins to accelerate and eventually sufficient gas is produced to cause a pressure build-up within the capacitor, eventually causing the capacitor to ‘vent’ (pop or explode!). The score-markings on the top of the capacitor are there to ensure the capacitor ‘vents’ in a controlled manner. A partial venting will also cause electrolyte solution to leak out, which further accelerates the capacitor’s demise. While measuring the capacitance of a capacitor seems like the right thing to measure, actual measurements on bad capacitors will either show a good reading, matching the value stated on the side, or, most likely a higher reading. Strangely the capacitance actually INCREASES as the capacitor is dying! In DC filter applications higher capacitance is normally a good thing because it provides more filtering of the high-frequency ripple from the SMPSU. However in the case of comparing an electrolytic capacitor’s stated value to the measured value, this indicates a dying capacitor – This provides a poor-man’s capacitor test: Look for higher than normal readings (in addition to basic visual tests)! The real parameter to check is the Equivalent Series Resistance (ESR). This resistance is in series with the capacitor and so cannot be measured with an ohm-meter – A special ESR meter is required (I use a Peak ESR60 £90). The ESR of a capacitor is important because it IS the parameter that increases as the electrolyte is consumed. The ESR is also represents the power loss in the capacitor (Ploss = Resr x I^2), this power loss causes heating of the capacitor, which further accelerates the electrolyte consumption. It is very normal to see capacitors in a SMPSU that look normal (no signs of bulging, etc) but actually have a high ESR reading and are in fact faulty – Always test the ESR of all capacitors (individually out-of-circuit). Again a poor-man’s test for ESR is to simply feel the temperature of the capacitor. If it is hot, then there are significant losses caused by the ESR. Finally, increasing the capacitance values of replacement parts may seem like a like a good idea to reduce ripple currents, but be warned that going too high may mess-up the dynamics of the SMPSU causing it to become unstable! Great site! I replaced the caps in my PSU. Now the computer works fine for about 15 minutes when the PSU starts smelling and the computer shuts down. The copper heat sink is super hot. Any idea why? I suspect one of the surface mount transistors on the bottom of the circuit board is damaged besides your blown capacitors that you had. Great instructions! I was able to successfully replace all the caps on the motherboard, which resolved the issue somewhat, however, I’ve still been having some issues with spontaneous shutdowns and failures to start, so I decided to have a look at the power supply. It also has some bulging caps, but while I was tearing away at the glue that holds everything steady, I accidentally ripped a tiny variable resistor in half! It was obviously some kind of preset. I still want to fix it, but the potentiometer isn’t well labeled, VR1 is al that’s printed on the circuit board. If anyone knows the value of that potentiometer or where I could find any equivalent one for a reasonable price, I’d really appreciate it. Here are a couple of things to consider. One, if this is the second power supply to go out in a short time, then I suspect the capacitors on the MOB are stressing out the capacitors inside the PSU. And, the other thing to consider is the capacitors don’t always look bad. In fact, the capacitors actually can dry out in the electrolytic juice, and no longer filter the voltages properly. It would be nice if all the capacitors that went bad would show bulging signs, but this simply is not the case. I have experienced many of the MOB capacitors that when heating up of the legs to melt the solder, the legs tend to come out of the capacitors because the internals of the capacitors are so bad, that the legs (anode and cathode plates) no longer are making a solid connection internally to the guts of the cap. Refer to how electrolytic capacitors are constructed. Additionally, the caps can actually leak out from the leg area. This is why many times the caps will not bulge on the top surface, but will blow out the electrolyte at the bottom and will not be readily apparent. 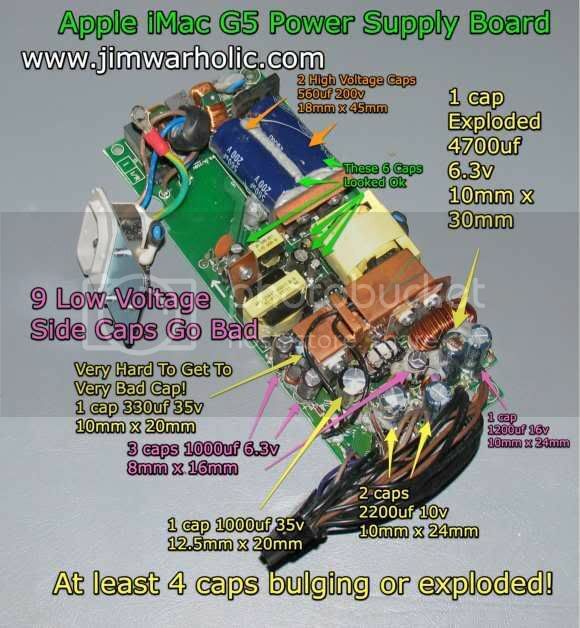 Refer to Apple iMac G5 Logic Board repairs for more information on this area.